We are seeing the biggest rise in support for fascism, the far right, racism, Islamophobia and Antisemitism since the 1930s. Hate crime has spiked to unprecedented levels. Whilst fascists and racists are mobilising on a scale not seen for decades, the far-right movements are gaining power across the globe. The election of Jair Bolsonaro marks an extremely serious point in the rise of the global far right. It came a day after the shocking antisemitic attack on the Tree of Life Synagogue, Pittsburgh, in which 11 people were killed. The majority of society opposes fascism and racism, but we can only defeat it if we come together and take action. The 17th November is our chance to show that in our thousands and millions we are proud of our diversity, and we stand united in our determination to drive back this toxic wave of hate. 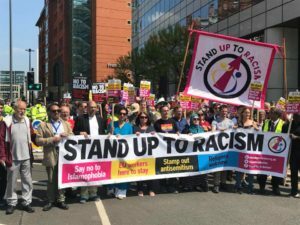 The demonstration is initiated by Stand Up To Racism, co-sponsored by Unite Against Fascism and Love Music Hate Racism, officially backed by the TUC and Unite, whilst also supported by Diane Abbott MP, John McDonnell MP amongst others. Our Branch has agreed to pay the cost for 5 tickets for members who wish to attend the demo – this is on a first come first served basis. 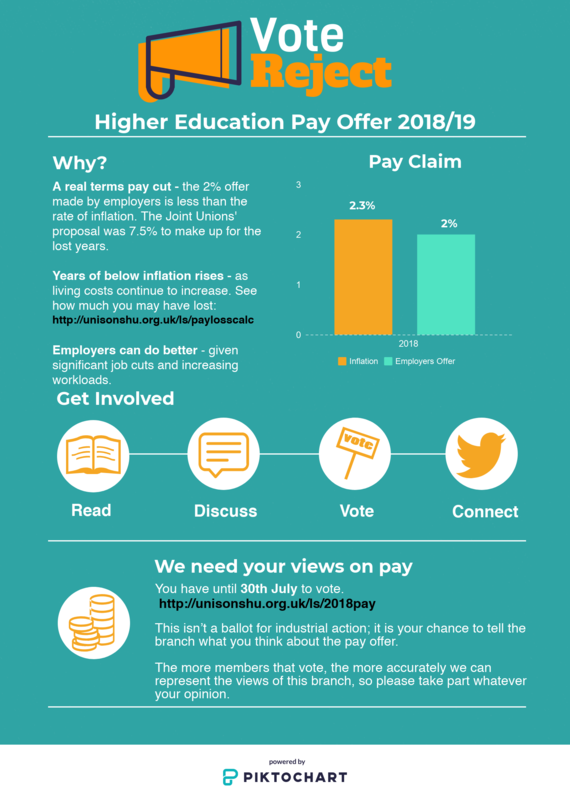 Have you had your say on pay? Due to the employers’ offer being significantly less than what was requested by all unions, Unison’s Higher Education Service Group Executive (HESGE) are recommending that members reject the employers’ offer. The Sheffield Hallam University Unison Branch will be running a consultative ballot which will be open for 3 weeks from Monday 9th July – Monday 30th July. This isn’t a ballot for industrial action; it is your chance to tell the branch what you think about the pay offer. The more members that vote, the more accurately we can represent the views of this branch, so please look out for further details and do take part. The Branch welcomes the decision to delay the PSOM consultation briefings. ● That various statements have been made which are felt to be at odds with evidence or feedback submitted, causing concern as to the validity of the proposals. ● The potential negative effect on the student experience in September of the current frontline proposals. ● The apparent lack of involvement of staff at all levels in some areas has led to a lack of confidence that the proposals are fit for purpose. ● That the University is rushing to make radical changes to service provision on an overambitious timescale, putting both student experience and staff at risk without the confidence that these changes will be successful. ● The project team ensures its proposals are evidence-based and clearly explained in the consultation document. ● That staff are given adequate time to read documents in order to be able to respond effectively. ● The consultation is meaningful and genuine and that the response to feedback is comprehensive and reflects openness to changes to the proposals. The Branch is seriously concerned about the likelihood of large numbers of job losses, and reiterates our opposition to compulsory redundancies. We expect the University to work to avoid redundancies, in line with the Change Principles. 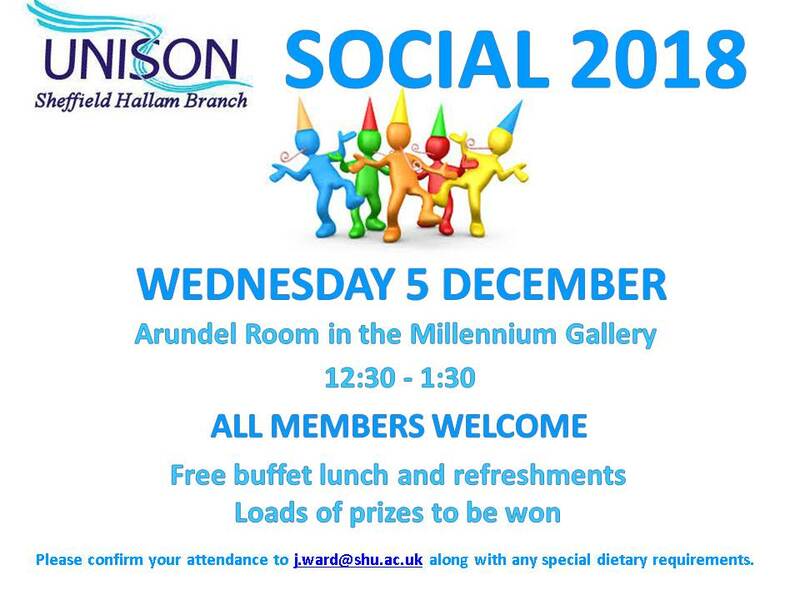 We hope that members have been able to sign up for one of the open briefing sessions on the Professional Services Operating Model: https://portal.shu.ac.uk/Pages/AllNews.aspx#237. If you haven’t please let the Branch know, to help us make the case for more sessions. UNISON has received formal notification that consultation on proposals for the future shape of professional services is beginning, and so it is crucial that there is full engagement with the open meetings. At this point UNISON has several concerns. First of all, although many people have been involved with the PSOM project in various ways, many others have not – and we now need to ensure that everyone has an opportunity and adequate time to participate in the consultation. Secondly, management have said they are committed to genuine and meaningful consultation. We believe that this means sufficient detail must be available to enable us to understand what is being proposed – not just structures, but also how services will be delivered, and whether there are any proposed changes to terms and conditions, and what they mean. Without sufficient detail we will not be able to assess whether the principles of the PSOM are being properly applied in the interests of students and the University, or whether cost-cutting has become the primary driver. It is acknowledged that the PSOM project has still not completed its work, and that consultation will happen in stages, but that adds complexities which need careful planning and clear and transparent communication. At this point we are not yet reassured that the necessary information will be published, but we are working to ensure that it is. Linked to this is the point that the timescales that are planned are ambitiously fast. But a large and complex group of staff and services need to be handled with care if serious mistakes are to be avoided. It cannot be done at breakneck pace. Thirdly, management have denied that there are any arbitrary targets for job losses, but we do know that it is envisaged that professional services will be “smaller” – this has been stated in public and in writing (for example, in Richard Calvert’s recent message). In any case there are agreed commitments to avoid compulsory redundancies, and UNISON will want to ensure that we stick to them – but this also means making sure that staff are prepared and supported, and that the sequencing of any changes does not shut anyone out. Finally, I envisage that we will need to hold some open meetings for members to discuss the PSOM consultation, among other activities. 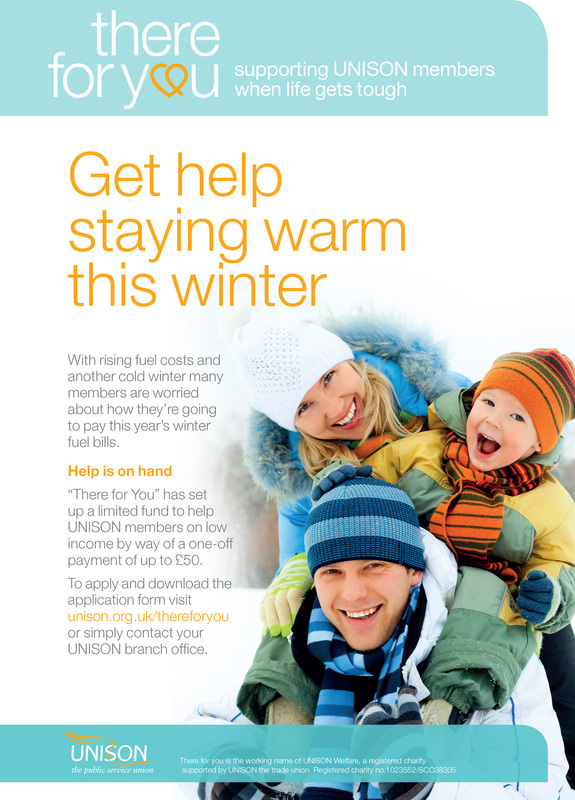 We will keep you informed as things develop, and will also be working alongside our colleagues in other unions. And please, ensure that your local steward or the Branch is made aware of any issues in your area – and talk to your colleagues about the importance of joining a strong union. The closing date for application forms is Friday 16 February.